Ondine's major key release in Spring 2006, featuring the Finnish star soprano Soile Isokoski who performs eighteen of Sibelius's Orchestral Songs and the tone poem Luonnotar, has received highest acclaim throughout the international press (ODE 1080-5). Ms. Isokoski is accompanied by the Helsinki Philharmonic Orchestra under the direction of Leif Segerstam. Shortly after the international release of this much-awaited hybrid SACD in April 2006, two major British newspapers immediately voted it as 'Classical CD of the Week'; "Soile Isokoski (...) has arguably the most beautiful voice of her type, excelling in Mozart and Strauss. Here, she sets down her equally glowing credentials as a Sibelian." (The Sunday Times, May 7); "...sung by Isokoski with a potent mix of tenderness and passion, a richness of voice and subtle dynamic inflections, with soaring lines beautifully floated and tailored. Newcomers to Sibelius's songs could find no more persuasive introduction; aficionados will be entranced." (The Daily Telegraph, May 13). The German online magazine Klassik-Heute.de wrote in a 10/10 review, "Soprano Soile Isokoski overwhelms not only because of the mere beauty of the songs, but she also delivers moments of consummate artistry." The disc features the standard repertoire piece Luonnotar (Daughter of Nature), completed in 1913, which is a powerful tone poem for soprano and orchestra and fits ideally for Soile Isokosiki's voice. Based on an excerpt from the Finnish national epos Kalevala, the song tells of the mythical creation of the earth and the sky. The other orchestral songs are dramatic and brilliant musical settings of Finnish and Swedish texts by Finnish poets. This recording contains almost all of Sibelius's songs that were orchestrated by the composer himself (the only missing song being out of Ms. Isokoski's vocal range). Almost all other songs featured on this recording were orchestrated by Jussi Jalas, Sibelius's son-in-law, or by others of his close contemporaries. Finnish soprano Soile Isokoski is recognized as one of the finest singers of her voice type. 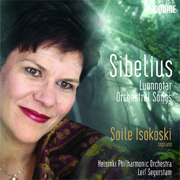 Subsequent to the release of this Sibelius album, she was interviewed and profiled by several prestigious music magazines, including the Opera magazine ("perhaps the finest Mozart and lyric Strauss soprano around right now"), the BBC Music Magazine (respectively in their June 2006 issue), and Gramophone (in July 2006), as well as in The New York Times on April 9, 2006. Soile Isokoski's recording of Four Last Songs and other orchestral songs by Richard Strauss with Marek Janowski and the Berlin Radio Symphony Orchestra was hailed as benchmark and received a Gramophone Award in 2002 (ODE 982-2). Ms. Isokoski will be performing the Four Last Songs at the BBC Proms on August 14, joined by the Finnish Radio Symphony Orchestra under Sakari Oramo. The Helsinki Philharmonic Orchestra, the oldest professional symphony orchestra in the Nordic countries, is well known today for its tradition of performing Sibelius, and it also premiered many of his major works, often with the composer himself conducting. Ondine has released an acclaimed edition of the complete Sibelius symphonies under the direction of the Leif Segerstam (ODE 1075-2Q). The recording of Sibelius's Fourth Symphony, coupled with Pohjola's Daughter and Finlandia, received a Classical Internet Award 2005 as 'Disc of the Year' (ODE 1040-2). Leif Segerstam became the 11th Chief Conductor of the Helsinki Philharmonic Orchestra in 1995. He has been praised by critics for creating powerful, convincing performances that are compelling both musically and emotionally.